In February 1957 Canada's CBC television network responded to the popularity of Disney's Davy Crockett with our homegrown hero Radisson. Among the many marketing ploys were the Radisson coonskin hats which were merely unsold Davy Crockett coonskins with the tails removed and a white feather added. The show was canceled before the run of the scheduled 39 weeks but was shown in England, Australia and the United States under the title Tomahawk. In elementary school history class in the fifties we were taught to remember Radisson and his sidekick Groseilliers by word association, to wit: "radishes and gross ill ears." 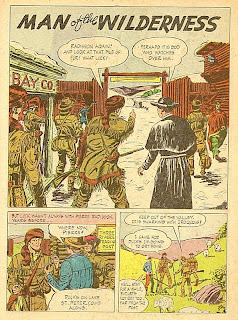 *Topix Comics, source of the Radisson comic above, was a Catholic supplement given away in Sunday Schools between 1942 and 1952. This story was from 1950.